This is a Korean name; the family name is Roh. Roh Tae-woo (Korean pronunciation: [no tʰɛ.u]; born December 4, 1933) is a former South Korean politician and ROK Army general who served as the 6th President of South Korea from 1988 to 1993. Roh was born on December 4 1933, into a farming family, Talsong, near Taegu, North Kyongsang Province. His father, a low-echelon civil officer in the district, died in a car accident when Roh was seven years old. With his uncle's help, Roh first enrolled at the Taegu Technical School but transferred to the local Kyongbuk High School where he was an above-average student. His high school record describes him as a "gentle and hard-working student with a strong sense of responsibility." Roh befriended Chun Doo-hwan while in high school in Daegu. During the Korean War (1950-1953), Roh joined the Korean Army as an enlisted conscript in an Artillery unit, being promoted to Sergeant Cannoneer of an M114 155 mm howitzer gun line. He later entered the Korean Military Academy, completing it in the first class of the four-year program, he graduated in February 1955 with a Bachelor of Science degree and a commission as an Army 2nd Lieutenant in the 11th class of the Korea Military Academy (KMA). A commissioned officer of the army from 1955, Roh rose steadily through the ranks and fought in the Vietnam War first in 1968 as a Lieutenant Colonel and later was promoted to Major General and the commander of White Horse Division in 1979. A member of the Hanahoe, a secret military group, he gave critical support to a coup later that year in which Chun became the de facto ruler of South Korea. Roh was a military general when he helped Chun lead troops to the Gwangju Democratization Movement in 1980. Roh held several key army posts such as Commander of the Capital Security Command in 1979 and Commander of the Defense Security Command in 1980. Following his retirement from the Korean Army in July 1981, Roh accepted President Chun's offer of the post of Minister of State for National Security and Foreign Affairs. Later, he served as Sports Minister, Home Affairs Minister, President of the Seoul Olympics Organizing Committee, and in 1985, chairman of the ruling Democratic Justice Party. Most notably, he oversaw preparations for the 1988 Summer Olympics in Seoul, which he officially declared open. Despite his involvement in the December 12, 1979 Coup d'état against then-President Choi Kyu-hah and the bloody military crackdown of dissidents in the Gwangju Uprising of May 18–27, 1980 and with an eye on the Blue House in the upcoming 1987 Presidential Elections, Roh began working to distance himself from the unpopular Chun government. The reason is that Roh worked to carry out his own agenda for democratic reform. By agreeing to meeting the demands of the political opposition in terms of political reforms with his eight-point proposal including direct election of the President, Roh successfully upstaged Chun and boosted his own image as a reformer. In June 1987, Chun named Roh as the presidential candidate of the ruling Democratic Justice Party. This was widely perceived as handing Roh the presidency, and triggered large pro-democracy rallies in Seoul and other cities in the 1987 June Democracy Movement. In response, Roh made a speech on June 29 promising a wide program of reforms. Chief among them were a new, more democratic constitution and popular election of the president. In the election, the two leading opposition figures, Kim Young-sam and Kim Dae-jung (both of whom later became presidents), were unable to overcome their differences and split the vote. This enabled Roh to win by a narrow margin and become the country's first cleanly elected president on December 16, 1987 and was inaugurated as President on February 25, 1988. 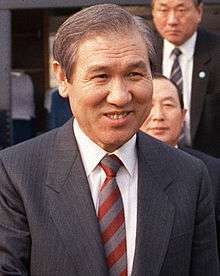 Roh's rule was notable for hosting the Seoul Olympics in 1988 and for his foreign policy of nordpolitik, which represented a major break from previous administrations. True to his word, he remained committed to democratic reforms. He also met with President Corazon Aquino for a series of talks between the Philippines and South Korea for economic, social and cultural ties, supporting Filipino athlete Leopoldo Serantes in the Olympics, and to discuss unification talks to end North Korea's hostilities after the Korean War. During his administration, Roh's stance as President was very active in diplomacy and steadfast in the push toward political and socio-economic reforms at home. Democratization of politics, economic "growth with equity," and national reunification were the three policy goals publicly stated by the Roh administration. Successfully hosting the 24th Summer Olympic in Seoul in his first year in office was a major accomplishment, followed by his active diplomacy, including his address before the United Nations General Assembly in October 1988 and his meeting with U.S. President George H. W. Bush and delivered a speech before a joint session of the U.S. Congress. He also conducted a five-nation European visit in December 1989. On July 7, 1988, he launched an aggressive foreign policy initiative called the Northern Diplomacy, or Nordpolitik, which brought about benefits and rewards to his government. 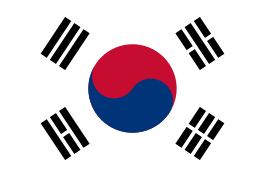 In 1989, Seoul established diplomatic relations with Hungary and Poland, followed by diplomatic ties with Yugoslavia, Romania, Czech Republic, Bulgaria, and Mongolia in 1990. South Korea's trade with China steadily increased, reaching the $3.1 billion mark at the same time South Korea's trade with the East European countries and the Soviet Union increased to $800 million. Seoul and Moscow exchanged full consular general's offices in 1990. Roh's emphasis on "economic growth with equity," although well received by the public, led to the dwindling in the annual economic growth rate from the high of 12.3 percent in 1988 to 6.7 percent in 1989. As labor strikes and demands for higher wages intensified, the Roh government imposed an austerity plan to keep South Korea's export-oriented economy more competitive internationally. However, higher wages and the appreciation of the won in value against the U.S dollar made Korean products less competitive internationally. In 1992, Roh's government sealed up a cave on Mount Halla where the remains of the Jeju uprising massacre victims had been discovered. In order to overcome paralysis of governing due to lack of majority support in the National Assembly, the Roh government sought to attain "a grand compromise" in partisan politics. The surprising announcement of the party merger on January 22, 1990 was an attempt to accomplish this political miracle. The ruling Democratic Justice Party merged with two opposition parties, Kim Young-sam's Reunification and Democracy Party and Kim Jong-pil's New Democratic Republican Party. The new established Democratic Liberal Party, which commanded more than two-thirds majority in the legislature, sought to establish political stability so as to enable socio-economic progress. On June 4, 1990, Roh, while visiting the United States, met with another Head of State, Mikhail Gorbachev, President of the U.S.S.R. The meeting ended 42 years of official silence between the two countries and paved the way for improved diplomatic relations. The historical significance and legacy of Roh's presidency is the broad political reform which he helped to start rolling, steering the country toward greater democracy and pluralism. Term limited from succeeding himself in the 1992 elections, Roh left office on February 25, 1993. In 1993, Roh's successor, Kim Young-sam, led an anti-corruption campaign that saw Roh and Chun Doo-hwan on trial for bribery. Ironically, Kim had merged his party with Roh's in a deal that enabled him to win the election. The two former presidents were later separately charged with mutiny and treason for their roles in the 1979 coup and the 1980 Gwangju massacre. Both were convicted in August 1996 of treason, mutiny and corruption; Chun was sentenced to death, later commuted to life imprisonment, while Roh's 22½-year jail sentence was reduced to 17 years on appeal. Both were released from prison in December 1997, pardoned by then-president Kim Young-sam. Roh has also admitted to corruption 16 years after being in office and is scheduled to repay illegally gained wealth of W24 billion (US$1=W1,118) of a W262.9 billion fine for corruption in office, at the age of 81. A staggering $21,466,905 of a total of $235,152,057 owed to the nation. Wikimedia Commons has media related to Roh Tae-woo. ↑ HIDEKO TAKAYAMA (June 19, 2000). "Ghosts Of Cheju". Newsweek. Retrieved 2009-03-30. 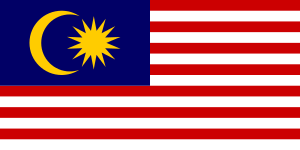 ↑ "Senarai Penuh Penerima Darjah Kebesaran, Bintang dan Pingat Persekutuan Tahun 1988." (PDF).